Motor vehicle parts manufacturers are increasingly using light weight vehicle components to improve fuel efficiency. 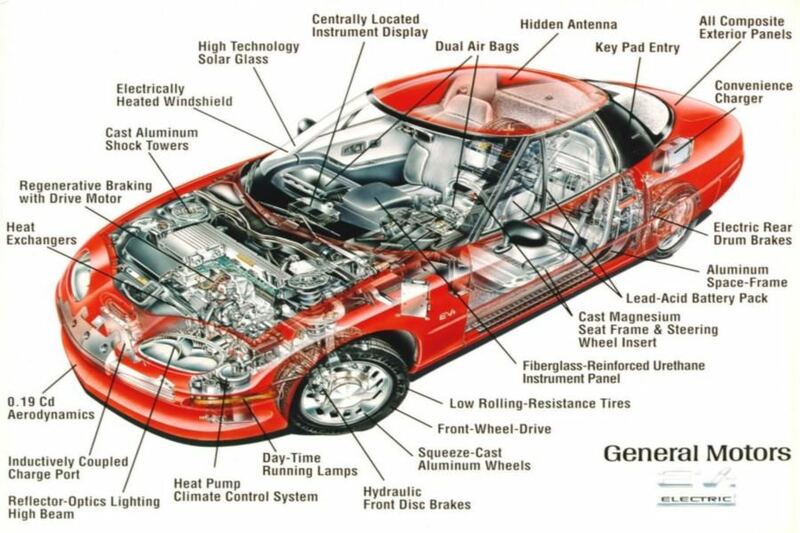 Light weight vehicle components enable motor vehicle manufacturers to reduce the overall weight of the vehicle, thus, lowering the fuel consumption. This improves the fuel efficiency of the vehicle while ensuring safety norms are complied. In this regard, automotive parts manufacturers are using advanced composites and high strength metals for producing motor vehicle parts. For instance, in February 2015, automotive engineering and consulting company Ricardo and aerospace composite supplier Albany Engineered Composites (AEC) entered into a partnership to provide light weight vehicle components such as composite body, chassis and other structural components to automobile manufacturers. This partnership includes the use of AEC’s technologies such as 3D composites for providing strength and durability required for motor vehicles. 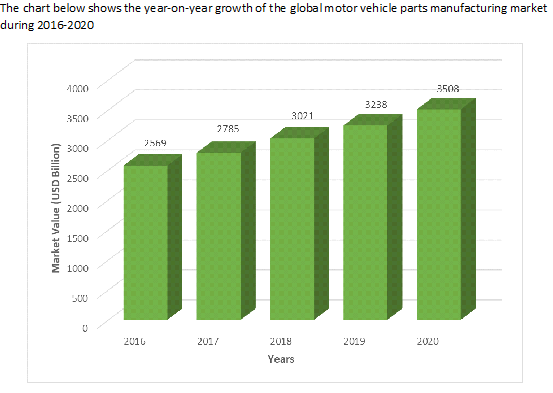 MOTOR VEHICLE PARTS MANUFACTURING MARKET TO GROW TO $3.5 TRILLION BY 2020 ACCORDING TO THE BUSINESS RESEARCH COMPANY The Business Research Company expects the global motor vehicle parts manufacturing market is expected to grow from $2.6 trillion in 2016 to $3.5 trillion in 2020 at a compound annual growth rate (CAGR) of 8.1%.Asia Pacific was the largest region in the motor vehicle parts manufacturing market in 2016, accounting for $1133 billion or 44.1% market share. This was due to a large middle class population in China and India, availability of skilled manpower to manufacture motor vehicle parts for automakers in this region. According to The Business Research Company’s Transportation Consultant, Abdul Wasay, motor vehicle parts manufacturers are producing engines that offer higher fuel economy and better performance. Efficient combustion engines increase the fuel economy of motor vehicles and also enable motor vehicle manufacturers to meet emission norms of several state and national governments across the world. They are using technologies such as advanced ignition, direct fuel injection, variable valve timing, and advanced transmission to reduce engine size and increase its power. For instance, in December 2016, automotive manufacturer Toyota launched new engines based on its Toyota New Global Architecture (TNGA) for standard gasoline and hybrid vehicles. TNGA-based motor vehicle engines are expected to offer 20% better fuel economy and 10% better power performance, as compared to Toyota’s existing engines. The motor vehicle parts manufacturing industry is further classified as follows – • Motor Vehicle Gasoline Engine And Engine Parts Manufacturing • Motor Vehicle Electrical And Electronic Equipment Manufacturing • Motor Vehicle Steering And Suspension Components (Except Spring) Manufacturing • Motor Vehicle Brake System Manufacturing • Motor Vehicle Transmission And Power Train Parts Manufacturing • Motor Vehicle Seating And Interior Trim Manufacturing • Motor Vehicle Metal Stamping • Other Motor Vehicle Parts Manufacturing Motor Vehicle Parts Manufacturing Market Global Briefing 2017 is a detailed report giving a unique insight into this market. The report is priced at $1000 for an individual user. To use across your office the price is $1500 and $2000 if you wish to use across a multinational company. About The Business Research Company Visit TheBusinessResearchCompany.com, mail info@tbrc.info or call +447443439350 or +918897263534 or +919160996838 for more information on this and many other titles. The Business Research Company is a market research and intelligence company, which excels in company, market and consumer research. It has research professionals at its offices in the UK, India and the US as well a network of trained researchers globally. It has specialist consultants in a wide range of industries including manufacturing, healthcare, chemicals and technology. The Business Research Company's management has more than 20 years of varied business research experience. They have delivered hundreds of research projects to the senior management of some of the world's largest organizations.